Your journeys across Middle-earth have taken you far in The Lord of the Rings: The Card Game. With this game’s expansive Saga Expansions and Adventure Packs, you have traveled from the shadowy eaves of Mirkwood, through the stone halls of the Dwarrowdelf, into the uncharted oceans west of Middle-earth and the deepest south of Far Harad. Your journeys are about to bring you one step farther into the wild. You have been hailed as one of Middle-earth’s greatest heroes, and we are proud to announce The Lord of the Rings™ Living Card Game™, a digital card game adaptation coming soon from the Fantasy Flight Interactive studio! What Is the Fantasy Flight Interactive Studio? Fantasy Flight Games is thrilled to partner with a brand-new studio and subsidiary of Asmodee North America—Fantasy Flight Interactive! This studio was founded by veterans of the digital game industry. The first project from Fantasy Flight Interactive will be The Lord of the Rings Living Card Game! For more information about FFI and The Lord of the Rings Living Card Game, you can visit their website here, or read on. Over the years, The Lord of the Rings: The Card Game has been a massively successful product for Fantasy Flight Games, pioneering the idea of the cooperative Living Card Game®, and inviting players to journey through the epic saga of The Lord of the Rings and weave their own stories in this rich universe. Fantasy Flight Interactive is adapting this game into a new format as a digital game—The Lord of the Rings Living Card Game. The physical game will continue to exist alongside the new digital game, offering fans multiple formats to enjoy and more ways to interact with the universe and the game, no matter where you are. As a digital Living Card Game, The Lord of the Rings Living Card Game offers something completely new to the realm of digital games. Within the game, you’ll choose a set of three heroes, build your thirty-card deck, and pit your wits against the evil legions of Sauron, battling spiders, Orcs, and more. Along your journey, you’ll have chances to earn new cards and devise new tactics along the way. Your games will not pit you against another player—instead, you will battle against the might of Sauron himself and the forces of darkness controlled by the computer, embarking on a journey that unfolds over multiple adventures of a narrative campaign. The Lord of the Rings Living Card Game draws its origins and inspiration from The Lord of the Rings: The Card Game, but there are some notable differences between the two formats, which designer Caleb Grace will cover in more detail below! 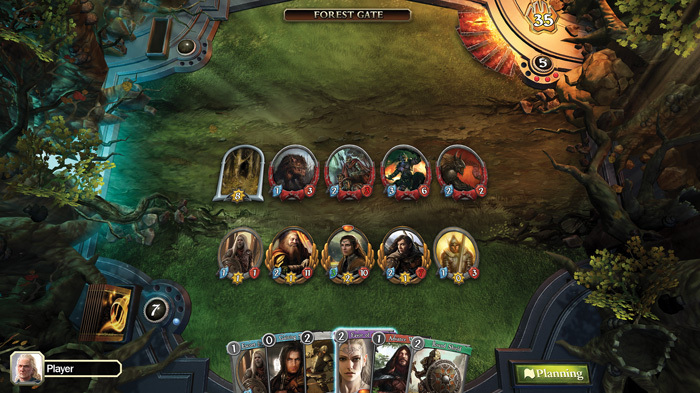 The Lord of the Rings Living Card Game is the first-ever digital Living Card Game, featuring an in-game economy built around fixed packs and a story-based campaign. There is no randomness inherent in the packs that you unlock through gameplay—you can look at the contents of every pack and know exactly what you are getting. 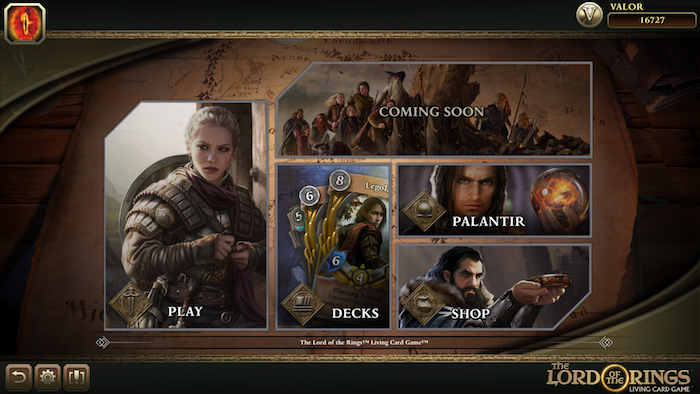 As you gain new cards, you’ll embark on a series of adventures across Middle-earth. Narratively driven and exceedingly replayable, The Lord of the Rings Living Card Game provides a digital card game experience unlike any other game. Read below for more information on The Lord of the Rings Living Card Game from designer Caleb Grace. The Lord of the Rings Living Card Game was initially inspired by the success of the physical version of the game, The Lord of the Rings: The Card Game. We wanted to take the things that players loved most about the tabletop game, and develop them into a digital game that you could enjoy on your computers and tablets. The translation from physical to digital also gave us the unique opportunity to evaluate which game elements were essential to the experience, and which ones could be trimmed in order to create a game that can be played in easily digestible 10-20 minute play-sessions. Our end result is a game that is easier to play than the LCG, but still provides the immersive experience of adventuring through Middle-earth. The Lord of the Rings Living Card Game shares the same concept as its tabletop predecessor. You’ll take control of heroes attempting to complete a quest in Middle-earth, but instead of representing the quest and the environment with quest cards and location cards, the digital game brings Middle-earth to life with stunning visuals and detailed backgrounds. These let players visualize the locations that they had previously only imagined, and as they advance from one location to the next, the scenery changes—creating the sensation of traveling through Middle-earth. Enhanced visuals and backdrops are not the only advantages of building a digital game: the AI for the game has been improved as well. Whereas the tabletop game could only simulate the sensation of a live, “thinking” opponent through card effects, the digital game has actual AI programmed for Sauron, so that he plays like a human opponent, playing minions and directing them to attack your characters. Not only does this make Sauron a more engaging opponent, it removes the stress of managing the encounter deck. There is no more book-keeping and scenario management—all of that is automated by the game. You only have to manage the cards in your hand and your characters in play. To defeat Sauron and complete each quest, you first need to build your own decks. Fans of the tabletop game will recognize how the heroes and player cards are divided into four spheres (Leadership, Lore, Spirit, and Tactics), but their role in the digital game has been somewhat changed. Heroes no longer have individual resource pools and cards no longer require a “resource match.” Instead, you’ll collect three resources at the beginning of each round, regardless of how many heroes you control. These resources can be used to pay for player cards belonging to any of the four spheres. The spheres themselves serve as a deckbuilding restriction. In order to include a card of a certain sphere, you must choose a hero belonging to that sphere for your starting lineup. Some cards require two or three heroes of the matching sphere in order to be included in your deck. This is indicated by a card’s level. A Level 1 card only requires one hero of the matching sphere to be included in your deck, but a Level 2 card requires two heroes of that sphere. A Level 3 card requires all three of your starting heroes to belong to that sphere. This system preserves the importance of the different spheres while streamlining deckbuilding and gameplay. Once fans of the tabletop game start their first quest in the digital game, they will immediately recognize the familiar sensation of sending their heroes on a mission and the challenge of overcoming Sauron’s forces. But instead of seven different phases, each round in the digital game is broken into two phases: Planning and Adventure. During the Planning phase, both Sauron and the player draw cards and collect resources. You can spend resources to play allies and attachments from your hand, but only after Sauron spends his resources to play enemies, objectives, and treacheries. Once you are done playing cards, you’ll advance to the Adventure phase. During the Adventure phase, you’ll attempt to complete the quest and defeat Sauron’s threats. The threaded turn structure of the Adventure phase allows you and Sauron to react to each other by trading turns back and forth until Sauron is out of actions and you choose to end the round. Each quest that you embark on is made up of several locations, and each location has a specific objective that must be completed in order to advance and win the game. These objectives are represented by objective cards, and you’ll complete them by using your characters’ willpower to make progress. Once an objective has progress equal to its quest points, it is overcome. Sauron will try to prevent you from completing objectives by attacking your characters with enemies under his control. Characters and enemies both have attack and hit point values. When an enemy attacks a character, they both deal their damage to each other and are then exhausted. This is a significant change from the tabletop game, where enemies always attacked first and you had to defend these attacks before you could counter-attack. By removing the defense value from the game and making each attack reciprocal, combat in the digital game is faster and more aggressive. Without the ability to direct enemy attacks or prevent damage from them, you’ll have to be smart about how you hold enemies at bay while your characters complete objectives. One of the ways that players will do this is with the smart use of important keywords like Sentinel and Ranged. Fans of the tabletop will recognize these keywords, but they mean something different in the digital game. The Sentinel keyword forces Sauron to defeat that character before attacking any non-Sentinel characters. This can buy time for the player to quest with a different character or play an event. It also combos well with the Ranged keyword. When a character with the Ranged keyword attacks an exhausted enemy, it does not take reciprocal damage. So, if an enemy exhausts itself by attacking a Sentinel character, a Ranged character can be used to attack that enemy without taking damage itself. These and many other innovations make The Lord of the Rings Living Card Game a game unlike any other digital game—and an experience that I believe fans of The Lord of the Rings: The Card Game as well as new players can love. The Lord of the Rings Living Card Game will launch first into Early Access via Steam, as a single-player-only game in the coming months. Fans can take part in Early Access by purchasing one or more of three Founder’s Packs, containing in-game currency, card packs, custom card backs and player tags, Avatars, and much more. The game will be launched as a full free-to-play release in 2018, with additional quests and cards and a steady stream of new content. For more information on Early Access, you can visit the Fantasy Flight Interactive website here. A new format for you to experience the realm of Middle-earth is at your doorstep—it’s time for you to take your first steps out of the Shire, on your own adventure. Look for The Lord of the Rings Living Card Game, coming soon from Fantasy Flight Interactive!